We will be back at 15:30 BST on Saturday for the third practice session and we hope you can join us again. Thanks for joining us, have a good night and see you tomorrow. Lewis Hamilton says he wants to clinch his fourth world title "the right way" by winning Sunday's Mexican Grand Prix. 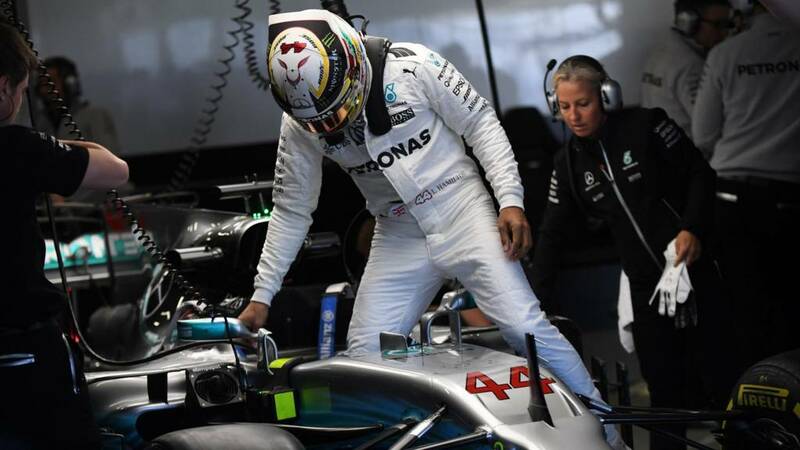 The Mercedes driver needs only to finish fifth in Mexico City, even if rival Sebastian Vettel of Ferrari wins the race. "I want to show what I'm capable of in every race," said the 32-year-old Briton. "I have no desire to finish fifth and win the championship while someone else stands on the top step." He added: "The dream would be to stand on the top step having won the championship." Red Bull's Daniel Ricciardo headed Mercedes driver Lewis Hamilton in a closely contested second practice at the Mexican Grand Prix. Ricciardo was 0.131 seconds quicker than Hamilton, who had a spin early in the session, with Max Verstappen's Red Bull ahead of Sebastian Vettel. Vettel was only 0.032secs off Hamilton as the Ferrari driver clings to his fading title hopes. Hamilton needs only to finish fifth on Sunday to clinch a fourth championship. The Briton had appeared to be struggling early on, his spin early in the second session following his being nearly 0.5secs slower than Bottas in the first. But he ended the session 0.3secs quicker than Bottas and with an impressively quick race-simulation run in the second part of the session. Daniel Ricciardo, the fastest man in session two, tells Sky Sports: "It is always nice to top a session, we know Mercedes have more on Saturday and we will need to find a bit more and we can still improve a few things. "So far it looks all OK, and it is going to be pretty close this weekend." Asked if he expects to face any grid penalties, Ricciardo answers: "No, unless something goes wrong. If she keeps ticking over, we will keep her in." These are the stats you need to know and a few stats you probably don't need to know. Who is your favourite Formula 1 driver of all time and why? Howard Martin: Graham Hill - of his time and I always felt he should really be flying Spitfires! And this is it. This is how they finished. Lewis Hamilton was second in free practice one, and did the same in free practice two. It is a very happy Red Bull team tonight. They have had two wins this season - Daniel Ricciardo in Azerbaijan and Max Verstappen in Malaysia. Can they make it their third of the year on Sunday? It's been very exciting. Red Bull look like the men to beat this weekend. Mercedes look like they might have some grip issues, and then there's Vettel and Raikkonen in contention, so we should see six drivers and three teams going for it on Sunday. Jeremiah Kariuki: Another great afternoon. Ricciardo being the fastest man and with a track record lap. That is the end of free practice two and Red Bull's Daniel Ricciardo is the quickest. Lewis Hamilton spun earlier in the second session but is second fastest. Four minutes of the session left, Daniel Ricciardo is the fastest man so far with a time of 1:17.801. "Feel something strange at the end of the straight line," is the latest of messages from Brendon Hartley, who will be quite happy with his day's work as he is 13th quickest. One of the others out on the track is Fernando Alonso. He goes well off the track and ends up cutting a large corner. Let's hope he doesn't do that on Sunday or we could have more controversy, just like we did with Max Verstappen last week. Bullet-proof reliability and consistency from his Mercedes car and a string of sterling performances from Lewis. Not having to win the race or even finish in the podium shows what a remarkable season he's had. A reminder of some times to look out for for the rest of the weekend. As always we will be with you every step of the way. It's good to see so many people here for a Friday afternoon. There's plenty of enthusiasm for Formula 1 in Mexico and, of course, they have a couple of local stars which helps. We haven't seen much moment in this graphic for a while. Fifteen minutes left for things to change. Brendon Hartley made a complete hash of his starting practice. He is clearly not confident yet about getting off the line and I would expect to see a few more practices before the end of the session.